30 children have died, most of them suffering from encephalitis, over a 48 hour span in Gorakhpur’s BRD Medical College allegedly due to lack of oxygen supply by a vendor whose dues were not cleared by the government-run hospital. Deaths due to Japanese Encephalitis (JE) and AES (Acute Encephalitis Syndrome) are an unfortunately common occurrence in Eastern UP and parts of Bihar, Odisha and Assam. By some accounts, in the past three decades, the two diseases have claimed more than 50,000 children in Eastern UP alone, the majority in Gorakhpur district. The opposition too has let loose predictable attacks on BJP and the CM – with many like ex-CM Akhilesh Yadav taking to twitter to express their thoughts on the issue and demand the CM’s resignation. What is being lost in the mad scramble to take potshots at Yogi Adityanath is the fact that out of all political leaders from UP, he is the one to have taken the most vocal stand against this epidemic. 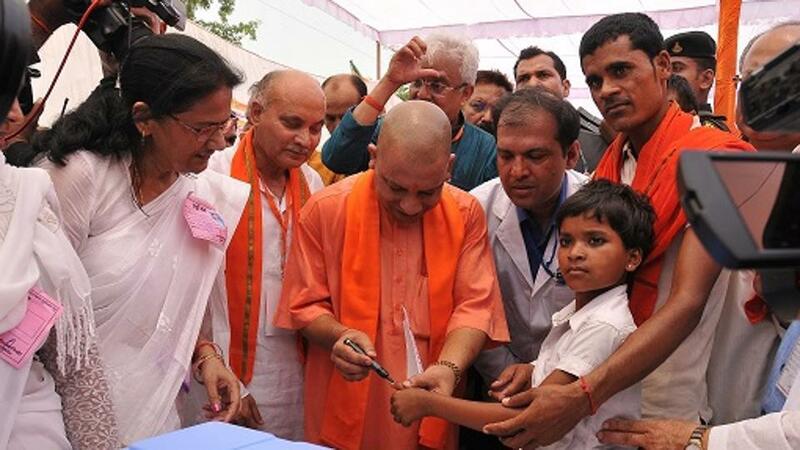 Soon after taking power in March this year, Yogi Adityanath had launched a campaign to eradicate encephalitis and to improve the state’s healthcare sector. As per this Hindustan Times report from May 2017, Yogi launched a drive to vaccinate 88 lakh children against JE in 38 UP districts, including Gorakhpur, Kushinagar, Deoria, Maharajganj and Basti. Conveying a nuanced understanding of the disease and the fact that AES (a group of clinical neurologic manifestation caused by wide range of viruses, bacteria, fungus and parasites) has no vaccine or medicine, back then the CM had said that the disease can be checked through clean potable water, effective cleanliness programmes along with immunisation drives. It is also noteworthy that Yogi Adityanath had visited the BRD medical college on Wednesday – just days before the deaths of children apparently due to lack of oxygen supply occurred. In that visit, he had warned officials of strict action if any irregularity was detected in the treatment of the patients. Yet, the children died, and going by multiple media reports, the private contractor in charge of oxygen supply did indeed have a payment issue with the hospital administration. These deaths reflect the deep rot in the bureaucratic-medical set up of UP. Officials have got into a zone of extreme apathy, secure in the knowledge that in the rigmarole of enquiries and fact-finding commissions, no one will ever be held accountable or that at worst they will have to face some departmental transfer. It is this slothful, derelict beast that Yogi Adityanath has to tame. The long-term solution is the sort of administrative reform required all over Bharat (the decolonization of our bureaucracy) encompassing right-sizing, recruitment guidelines, training, a performance-oriented work culture, functional autonomy and accountability, lateral induction of subject matter experts and rapid digitization of public services. In the short-term, Yogi would do well to emulate some of the methods used by ex-CM Mayawati to get work done in UP’s infamous administrative and police set up. Yogi and all BJP MLAs & MPs in UP should also be mindful of the fact that they have very little margin for error – all the sins of the last 15 years of ‘samajwadi’ (mis)rule will be dumped at their doorstep and the so-called liberal-progressive media will amplify the opposition voice. Hindus of UP have handed a decisive mandate to BJP in the desperate hope of a better, dignified life. And BJP has taken the right step in appointing an energetic, intelligent and passionate Yogi as CM. He needs the support of each and every functionary of UP BJP to complete the massive task of resurrecting UP. For a start, whoever was responsible for the unavailability of oxygen in the BRD medical college needs to be identified and dealt with sternly.